Anyway, we have completely finished the veggie oil conversion and are working out a few kinnks ( air in the system). Moss ( yes, he has finally agreed to post on something !!) will be posting on it in detail and he is still writing it all up, so look for that in a few days. Due to circumstances beyond our control, most notably rain, we have had to push our launch date back another week. When we leave we will be running on veggie oil and hope to do so all the way to C.A. We will be looking for places with free wifi connections and posting about our progress along the way. 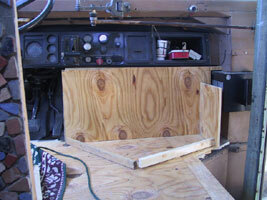 This week we managed to complete our little sound modification project in the front of the bus. You see, the 9.0 L diesel is a VERY loud engine and we could barely hear each other when it is going, and more importantly we cant hear our music. So Moss decided to build a wall and box thingy in the front of the bus ,under the dash. He built a wall,stuffed it with insulation,then built a box around that, stuffed it with insulation then mounted our c.d player and xm satellite radio in that. It seems to have quieted the engine noise quite a lot.I have posted pics of the first stages, but do not have any at this time of the last stages. I will post them shortly. Besides that we mostly put up some more t&g and worked on the engine.Since we will not be able to finish the interior before we leave ,most of the wood will have to go in the middle of the floor,along with our water tanks (groan). 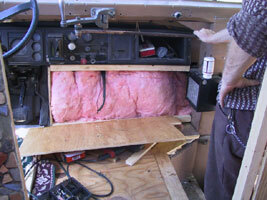 We stuffed insulation behind the wall to help muffle engine noise. This is the wall we are building in hopes that it will muffle engine noise.Behind this wall is fiberglass insulation. Astra, Pippin, and Joseph haning out in their new custom built encloseures. O.k,now,I have been trying to keep my George Bush hating, republican bashing tirades to a minimum, but I have to let loose today. I simply cannot believe what this man is now doing to the few remaining wildlands and the creatures that inhabit them. It simply defies logic of any sort. I am just so disgusted,outraged and sadened at what he plans to do here. My heart is heavy when I think of the fate of these sacred places. What is happening to this country ?? Who is this crazy man, and why does it seem that half of this country is sleeping?? Why do they not see?? It seems he is just hell bent on destroying and exploiting every last bit of this country for profit and greed.Nothing is sacred, nothing is off limits. Not even the constitutuion. He has unjustly waged war on other counties,this countries poor and middle class and now, our National Forsest and the few pathetic laws that were in place to protect them and their inhabitants. He has simply gutted and made a mockery of those hard won laws and regulations. We are moving increasingly away from a democracy towards something very different, something run by bigotted right wing evangelical christians who seek to take away our freedoms and force us to worship their gods. Why are we allowing this ? Fear. We are so afraid of another terorist attack like 911 that we have lost all grip on reality and common sense.Our fear has allowed us to elect the most inept president in history. It's funny,because you dont think it can ever really happen. "Of course, we say , trying to reassure ourselves," the best man will always get the job. Someone smart, fair , who loves this country and upholds the ideal of the presodency to its highest honour. You assume that someone mature, level headed and selfless will get the job." You would never imagine, in your wildest dreams that a complete mindless, self serving idiot could actually win ,but it happened,it really happened and its almost hard to believe. How does this happen, shurely our system is foolproof. What happens when a country is so sharply divided that we have the ignorant and apathetic masess deciding who wins? Well, we get an ignorant and apathetic person in the white house. We should never take for granted our freedoms. It all seems so stable, doesnt it ?? It is a facade.We are only ever centimeters away from total collapse and regime change.It only takes a few nut balls to get in there, pull the wool over everyones eyes, appoint a few of their buddies to high position, change a few laws, pay some people off and before you know it everything is different, and there is not a damn thing that can be done, short of violent revolution, NOT something I advocate. Look at India, it used to be the hub of the world, look at Rome, and so many others.We may think we are on top now,but history is rife with civilizations, empires and countries that have risen and fallen,and it can happen very easily. You just wake up one day ,look around and say, " what happened to my country?" I am scared,very,very scared . Next Monday marks the final day for public comment on a proposed new Bush Administration rule that will restrict public input and environmental review of forest management plans under the National Forest Management Act (NFMA). It will also rescind wildlife protections that were established decades ago under President Reagan. Under the Bush Administration's proposed forest plan rules, it would no longer be necessary to complete an environmental impact statement, a basic requirement of the National Environmental Policy Act (NEPA). Environmental impact statements ensure that forest decisions are based on the best available science. By removing this step, an important tool for forest managers to evaluate plans for potential harm to water, wildlife, old-growth and roadless areas is eliminated. Wildlife viability requirements will also be negated, meaning that viable levels of native fish and wildlife populations will no longer need to be maintained. The Forest Service will also be relieved of duties to monitor wildlife populations. 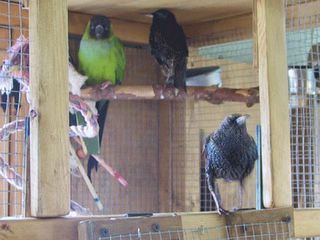 Instead, forest plans need only a "framework to provide the characteristics of ecosystem diversity in the plan area." Disclosure, and even studying, cumulative impacts of management activities across the national forests will be unnecessary under the new regulations. Environmentalists point out that lack of reliable public information regarding environmental consequences of forest plans -- combined with increased discretionary power over the level of scientific involvement in forest planning -- will mean an open door for corporate incursions into timber, mining and oil resources in our nation's forests. "This is yet another example of the Bush administration putting industry profits ahead of the interests of Americans," Randi Spivak, executive director of the American Lands Alliance, told BushGreenwatch. "The new rules reject science and demonstrate blatant disregard for public input. Americans care deeply about the places where they hike, fish and relax, and want to protect these places for future generations. With Bush¹s allegiance to the timber, oil and gas industries, what is now a forest heritage could soon be history." ### TAKE ACTIONSubmit a comment through the American Lands Alliance. Picking up where we left off, Moss and I were able to conjure up a bit more money, just enough to finish up a few things and pay for insurance and registration. We eagerly set upon our tasks, motivated by the possibility that finally we would be able to drive away from this forsaken state. However, In order to register the bus we needed to have an officer check the vin.This is due to the fact that the bus was originaly from New York . No problem,we thought and imediately called to have someone come down and check.Within a half hour a police car pulled up , two heavy set men got out , gave us a quick look over, and asked if we had called for a vin check. "Yes officer,right this way", I said leading him through the gate and into the backyard where our bus set. We lead him down and into the bus..They asked where the vin number was and I pointed to a small sticker above the drivers window. Taking the tiltle in his hand he walked over the the sticker and proceeded to compare numbers. After a few minutes he looked up and informed us that the numbers did not match. What, that could not be we told him,we bought this bus fair and square ! Moss and I franticly began looking all around the bus for any trace of another vin number,even the officers helped,but to no avail.We found no trace of any other vin number. We called the place where the bus originaly came from in new york and they assured us that they had given us the corect title,they only ever had one bus with that make and year,and that they had registred it in new york for many years now. Next we called the International dealership to see if they had any other ideas where the vin could be.They did not. After a bit of digging around discovered that, aparently somewhere down the line a few numbers got skewed and no one ever caught it. We called the DMV in New York and the lady informed us of the long ,excructiating process involved in procuring a new title. It would take up to two months. No way, we have to get out of here, we thought.We have to get to C.A where we have work and can make some money to finish this bus. To make a long story short, we eventualy discovered a way where we can get a temp 30 day tag ,enough time to get us to c.a . Once there, we can go through whatever process is needed to correct the title. O.K then, we thought, breathing a huge collective sigh of relief. Now we can get back to work and hopefully get out of here on time. Today we discovered that the key to the bus is missing. O.k, worst case sceario we pay 100 bucks to get a new one made. Since the title is not right we do not ,techincally own this bus. In fact we probably own some bus in a junkyard in brooklyn. Anyway, that is about where we stand now. We have a few more places to look before we really start panicking. Whatever the case though,there is always a solution,and it is all in how you look at it. I am really starting to get that lately., whatever the problem,there is ALWAYS a satisfactory solution. The fun part is figuring it out.To do that one needs only to keep their minds and hearts open to all the possibilities available. Isn't life exciting ?? I often feel as though my life is a novel and I can hardly wait to see what comes next ? Whats around the bend ?? Where will I be in a month, a week, a year ?? When I was younger and hitchhiking around I used to sometimes just close my eyes, point my finger and turn in a circle. When I opened my eyes,whatever direction I was facing that is where I would start hitchiking. Another old favorite is to close my eyes and throw a small cystal or some other special stone on a map,wherever it lands that is where I would go. I think it would be fun to someday do that with a world map ! Anyway, as far as the conversion process goes, we have made some big progress. The T&G floor is going down,we built a bookcase and bought all the rest of the parts for the veggie conversion. 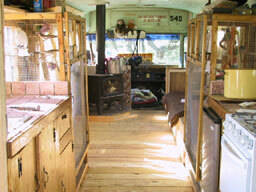 Before we go we need to paint it and finish the conversion,then off to C.A we go, probably in about a week or so. Here you can see our partialy laid, unsanded and unstained t&g flooring. 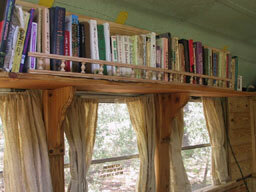 This is the bookcase we are building above the window seat. Eventualy we will build two cabinets on either side.